Trying to find a costume with a little more oomph this Halloween, but still want to show off Star Wars style? We now offer a new set of grand heritage costumes that are sure to make you feel ready to take on the Sith, conquer the galaxy, or rule Cloud City! A Grand Heritage of Star Wars! As the new villain of the Star Wars movies, Kylo Ren still has a lot to show us. He dueled Rey, sent Han Solo down an endless shaft, and even took a bowcaster bolt straight to the chest. 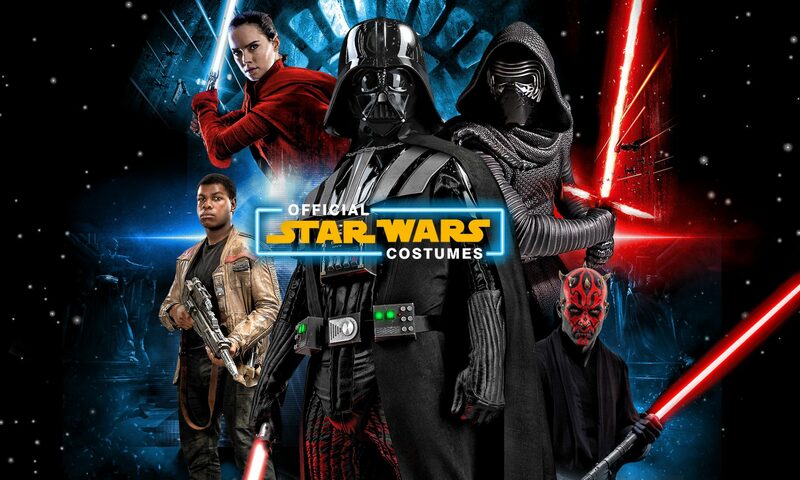 Pick up the Grand Heritage Kylo Ren Adult Costume to turn yourself into the next generation of the Sith. Continue Darth Vader’s legacy of power over the galaxy! Wear the Grand Heritage Rey Adult Costume to become the newest heroine of the sequel trilogy! She may not know much about her history and heritage, but she knows she has a great destiny in store. As she battles against Kylo Ren and the First Order, this young Jedi looks to save the galaxy from the Sith once again! He isn’t the first space rogue, but Han Solo is the progenitor of every morally-ambivalent spacefarer since the beginning. When you get the Grand Heritage Han Solo Adult Costume, you’re ready to join Luke, Princess Leia, and your dependable co-pilot Chewie at what will eventually turn into one of the greatest movie events of all time! In the Grand Heritage Lando Calrissian Adult Costume, become the famous ruler of Bespin’s floating Cloud City! The Empire made a grave mistake when it double-crossed this sharp-witted smooth talker. Don’t miss this character from the Empire Strikes Back–looking good has never been easier! The Rebels must always be ready to fight a larger and more powerful force. In the Grand Heritage X-Wing Fighter Pilot Adult Costume, you’re part of the Rebel’s space-fighting force. Launch the attack against the Death Star, defend Echo base, and battle among dueling fleets over the forest moon of Endor! Thanks for reading! Come back next week for more fun fan information and costumes. Don’t forget to enter our third annual Halloween Sweepstakes! It will soon be July Fourth. A time when, in the U.S. at least, we celebrate our country’s independence and beginning. We also have long firework displays that begin only after sitting in a large field for too long while being devoured by bugs, have barbeques with shaped meat tubes and fruit that is almost literally red-colored water and black seeds contained in hard rinds, and sit alongside roads as multi-colored cars roll down them, followed by people making noise with instruments and little guys with fezzes in tiny cars. So instead of those things we’re going to look at what our favorite fictional characters would be doing a July Fourth analog. For the fireworks display, our heroes gather on the canopy village of Endor, surrounded by the furry Ewoks, enjoying some interesting percussive music and native treats while they wait for their hosts’ galaxy-renowned display to be ready. They’ve already seen an example during the celebration feast after the battle of Endor, and they can’t wait to see it again. Unbeknownst to them, Imperial remnants are closing in on their position! Their laser rifles are primed and ready to take down the fledgling New Galactic Republic. As they take aim at our heroes, they- This doesn’t really seem very July Fourth, now does it? Let’s adjust a few things. Weapons trained, they prepare to fire. Suddenly, water balloons and squirt gun blasts rain upon our heroes! They jump into action, furiously pumping their own squirt guns until the pressure is high enough to return fire. Before they can take aim, a volley of water balloons lands near them. Han Solo stumbles to his feet. Water sheeting down his face obscures his vision. He rolls and finds the defense of a cambylictus tree, clothes soaked. He shakes a still Ewok body at his feet before more blasts of water force him farther into the village. Luke, having decided to spend some quiet time before the fireworks, hears the attack and races to help. His lightsaber is no help against the water, and in fact it shorts the weapon out! He runs, trying to find a weapon to fight back. He runs into his sister Leia, whose hair has come undone – she looks like a drowned wookie. Han Solo gets deeper into the village, pursued by the Imperials, and find Chewbacca, angry, wet, and stinking. The wookie grabs a huge bucket of water and slams it over a Stormtrooper’s head, flooding the soldier’s armor and stunning him. Han and Chewie abscond to the largest tree in the village, meeting with the Jedi siblings. Within the tree: a potent armory of water-based warfare. They arm themselves and fend off the approaching battalion! It is a ferocious battle. After hours, the Empire is defeated, and they retreat. Our heroes, and the Ewoks, celebrate with delicious cooked Dindra and sweet Cardellian mint, watching the delayed fireworks display with relish. Their July Fourth is complete. He did; that’s not what we’re arguing. But what if he shouldn’t have? In writing, there is a masterful technique called “show, don’t tell.” This means that, if you want to convey a piece of information, reveal it naturally instead of having a character (or the narration) say it point-blank. This may be even more important in filmmaking, since it’s primarily a visual art. A lot can be shown in scenes without dialogue, narration, or even many actions. Say for instance you’re making a space opera film in the seventies. You have a loveable rogue character, someone that guys want to be and women want to be with. He’s smug, cocky, and skilled. You have two main options to display him: the first is to have another character, a farm kid out on an adventure let’s say, tell another, perhaps older character that this rogue character is “Smug, cocky, and skilled.” The rogue character looks on with pleasure. Maybe not a bad idea, as long as your character proceeds to act accordingly. The character has described himself by saying nothing about himself, only through his actions and body. We’re being shown the character, instead of having it told to us. So when Han fires at Greedo mere moments after Greedo has threatened to kill him, Han is set up as someone not afraid to break the rules, someone who shoots first, asks questions later, and someone who has to act fast to keep himself safe. Han’s actions later in the movie build on this formative scene, fleshing out everyone’s favorite bad boy space captain. Let’s look at another example. So your space opera story is a hit, and you decide to make an unrelated sequel, using the space-rogue’s son as the main character. The son is a failed revolutionary, captain to a small smuggling ship with a diverse and interesting crew that flees the ruling empire, constantly breaking down, running out of gas, and coming into contact with flesh-eating humanoids from the edges of space. This description may sound familiar to an entirely unrelated character, Malcolm Reynolds from Firefly. Multiple times in the short-lived series, Captain Mal unloads on unsuspecting, defenseless, and even surrendered enemies because it keeps him, his crew, and his ship safe. Mal is a close second on our all-time favorite space rogue list, so it’s no surprise the parallels are drawn so smoothly. He’s dangerous, crafty, and refuses to back down. That said, and understood, there’s something that needs to be recognized: Malcolm Reynolds is not a good guy. He is the bad guy. We see him fight against the “Alliance,” the show’s Empire analogue, and even lose a civil war, so we’re meant to root for him. But why? The Alliance has created space fleets, we see boxes upon boxes of medicine, and any planet under their control is flourishing. On the other hand, the planets on the fringes are ruled by lunatics, killers, and space mafiosos. The only things we see the Alliance do that can be construed as absolutely bad (the experiments on River and SPOILER their turning the citizens of Miranda into the reavers) can easily be called the unfortunate and unforeseen consequences of attempts to do good. But Han isn’t a bad guy. He saved Chewbacca from space-death after the wookie tried to kill him, is actually attempting to pay Jabba back, and offers to fly a couple of backwater hicks to Alderaan, even without the money up front. He kills Greedo because Greedo will absolutely kill him if he doesn’t get Jabba’s money. In fact, the struggle between Han’s rogue side and his “good” side is apparent in the very first movie; a good example would be his triumphant return to the Death Star run. Han is constantly at odds with himself on how to act. Save the Princess and help the rebellion, or get a reward and clear his debt with Jabba? His attitude flips on a dime a number of times in the original trilogy. Yes, certainly, the ham-fisted change to the original scene is jarring, and Lucas’ desire to adjust the original movie is unwarranted, but there may be more here than changes just for changes’ sake. Whether you’re heading out with your love or staying in for a quiet night, we know you’re really wondering what your favorite Star Wars characters are going to be up to this Valentine’s Day. Well, we have just the thing. Read on, and be enlightened! Leaving the kids in the capable hands of C-3PO and R2-D2 (who are robots, and thus incapable of love), Han and Leia will likely take a trip to a romantic, out-of-the way locale, such as the diamond planet or the Umbex III “Rings of Passion”*. Later, they may have a shopping trip on Coruscant, or swing their political power for a comfy table on one of the metropolis-planet’s best restaurants. Still dating, Luke wants to make Valentine’s Day a special event. His options are many; there is no shortage of romantic sights out in the galaxy, both among the stars and on planets (Luke is also trying to one-up his father’s sorry attempts at romance). However, given the track record that these two hold, they both come heavily armed, expecting at the very least an Imperial remnant out for blood. In the end, it just helps to draw them closer together. Chewbacca has the opportunity to travel home and visit his wife Mallatobuck and son Lumpawaroo. He will mostly enjoy a home-cooked meal of wookie staples, and healthy amounts of cortyg brandy before a quiet night spent with his family. Mothers, lock up your daughters – and yourselves, just to be safe . . . in fact you’d better just lock up everything – Lando is looking for love. He’s going to hit the hot spots in Bespin, Coruscant, and all the other planets that are full of eligible ladies ready to spend time with a real charmer. His exploits will go down in legend. Whatever your plans, we hope your Valentine’s Day is great. Thanks for reading, and be sure to visit next week for more fun Star Wars information!